At this point, you're almost weirder if you don't use any social networks than if you were a social media obsessive who tweets, Facebooks, Instagram and hashtags the hell out of your vocabulary. It's how weird the world is now. Social networks are real life. But who are the people who make up these worlds? 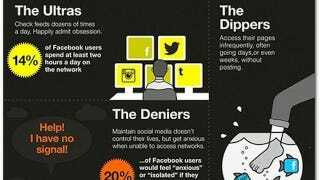 If there are 12 personality types in social networks, which one are you? The infographic, created by First Direct Bank, shows 12 distinct different personalities: Ultras, Dippers, Deniers, Virgins, Lurkers, Peacocks, Ranters, Changelings, Ghosts, Informers, Quizzers and Approval Seekers. For Twitter, I'm an Ultra in checking but a Dipper in posting. For Instagram, I'm a Lurker. For Facebook, well, I don't use Facebook (does that make me a Denier? cue weird looks).